Hey guys welcome back to my blog! 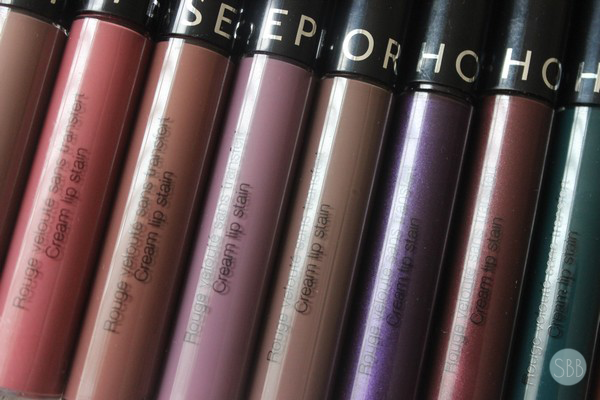 Today I'm going to be sharing a review on the Sephora Collection Cream Lip Stains which are Sephora's Liquid Lipsticks. They are one of my favorite brands for liquid lipsticks and I feel like they are underrated a lot of people don't pay attention to the Sephora line but these are really good. In this video I do talk about the Cream Lip Stains quickly so here I'm going to talk about why I love them. I loved the Sephora liquid lipsticks before they came out with new shades and I love them because they are priced at a great price, the formula is wonderful. Drys down fast when applied but doesn't dry out the lips. Even with multiple layer of this liquid lipstick it doesn't give a dry feel to the lips. This last all day long you may have to do a little touch up here and there. After I eat I always touch up my lips even if I don't really need to, but over all if you went out and forgot your Sephora liquid lipstick at home you would be ok and wouldn't need to touch up. I really love these liquid lipstick and I'm so happy that they finally come in so many new colours! Have you tried the Sephora brand of liquid lipsticks? These are all pretty unique colours which are nice to see since many brands like to always keep it safe with nudes lol. All of them swatched look gorgeous on you btw! I just recently bought one of these! It isn't my favorite so far, but I have to keep trying them out to see for sure.